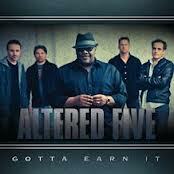 A staple of the Milwaukee blues scene, Altered Five arrived as a cover band, “bluesifying,” the Rolling Stones, Prince, Sting and the Pretenders. Drawing from an incredible stretch of influences ranging from Stax to Clapton, Motown, Deep Purple and Bootsy Collins, the band began concocting an intoxicating cocktail of original blues-rock fusions.. Currently touring Southern Wisconsin to promote their jaw-dropping sophomore effort, “Gotta Earn It,” they live by the words they play, earning it the hard way, on the road. Communicating through email, it soon became apparent this versatile band operated as a tight-knit unit, sharing the spotlight and dividing the credit for their gutsy soulful sound. Maximum Ink: How did you come up with the band’s name? Jeff S: We wanted something that signified our music is a team effort. JT is clearly our frontman, but our sound is a blend of all five of us. The “altered” part fit because we wanted to be different in some way—originality was and still is important. And, of course, the name is also a play on words with the musical term for altering the fifth of a chord. Early on, we arranged a lot of well-known songs in a bluesy style so I guess you could say the name worked as a double entendre. MI: The core of you, Mark and your older brother had already been a blues-playing band, was there a reason for expanding the trio into a quintet? Jeff S: Mark, Scott and I never played in a trio. That would mean one of us could sing, which is a stretch [laughs]. In the late 1990s, we played in a five-piece blues outfit called Todd Greene & The Blue Machine. The group played for a couple years, and did some writing and recording, but we never really got off the ground. Shortly after that band fizzled, we set out to start something new. We didn’t want to play blues standards all night; we wanted something truly different and musical. I met JT once about a year earlier because he was going to sub on keys for a club date. The gig didn’t pan out but I remembered him saying, “I sing, too.” We called him to jam and, sure enough, he could really sing! Our original keyboard player left around 2005 and Ray was the first keyboard player we called. He’s a real pro and fit right away. MI: Good music is a lot like good food - tasty and satisfying - if you could transform your band into chefs what sort of food would this new album serve up? Scott: It’s sort of like beef stew. Bass and drums hold down the meat and potatoes. Guitar and keys add the other vegetables and sprinkle in the salt and pepper for zest. Vocals smooth things off like a fine wine. All of those things separately are good, but put together in just the right amounts make something really great. We’re always mixing up the music. We’re not afraid to add a pinch of this and a dash of that if it just feels right. MI: Blues are about struggling - what was the biggest set-back the band has had happen to them? Jeff T: We’ve been together almost eleven years and weathered the ebb and flow of being a blues band in these parts.. Just when it seems like the scene is picking up a bit, it pulls back, and so on. We’ve seen a few new festivals pop up but then a couple blues clubs turn to other styles of music. We’ve stayed the course and continued to get our message out. Folks at the Madison Blues Society and other live music supporters have been extremely helpful, and with our new CD, we’re on another upswing. MI: There’s something direct almost primal about the blues and yet it’s more than playing by the numbers. How can you tell you are playing the real deal? Scott: To me, blues is a feeling. We all play off each other. Many times playing live, the songs flow into a different shape depending on our moods, the crowd, the weather, or whatever. Blues is not really like constructing a perfect pop song. Blues happens when the players react to one another at any given moment. The dynamics, the push-pull of the vocal or solo against the rhythm section, and the way the singer delivers the lyric… that’s the magic of the blues. Jeff T: We don’t worry about trying to sound authentic or trying to fit a certain formula. We just sing and play what feels right and fits the song, and somehow it always turns out sounding like us. If you think too much about trying to be, as you say, the “real deal,” you lose your own originality. Listeners can tell if you’re trying to be something you’re not; we just play with conviction and let the chips fall. MI: What do you think the biggest misconceptions are about playing the blues? Jeff S: Some people think it’s a simple music form. Three chords and lyrics like, “I woke up this morning” or “Don’t quit me baby,” but there’s so much more too it. There are layers and layers of nuance, not to mention sheer power and energy that rival any style of music. Blues has the ad-lib of jazz and the power of rock all rolled into one. And another misconception is that blues musicians have to grow up on a plantation or be uneducated. It probably helps to not grow up in the Hamptons, but the blues touches everyone—and everyone has a right to sing about it. MI: There’s lots of American cities that gave birth to different offshoot of the blues. What place would the band consider their spiritual roots?